Are you a DIY beginner? More at ease with an iPhone in your hand than a screwdriver? Does the thought of hanging photo frames and shelves terrify you? 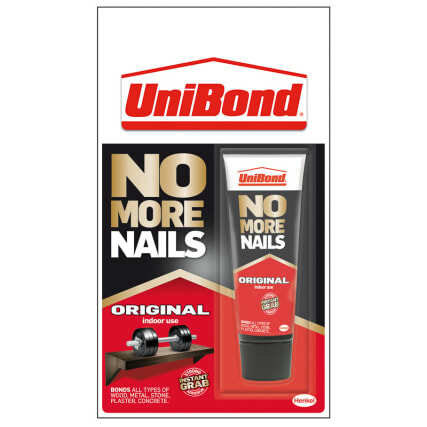 UniBond's No More Nails has the perfect solution: Click & Fix! 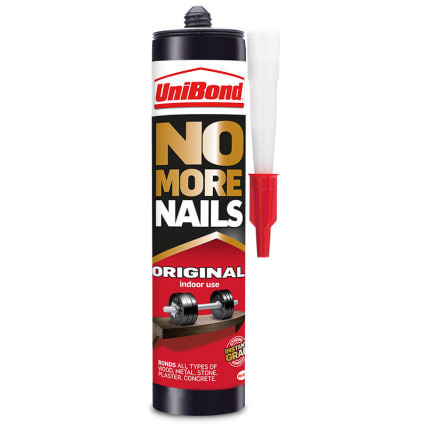 Say hello to your new best friend for your next home improvement project. What is Click & Fix? Click & Fix is a super easy pre-dosed mounting glue applicator. 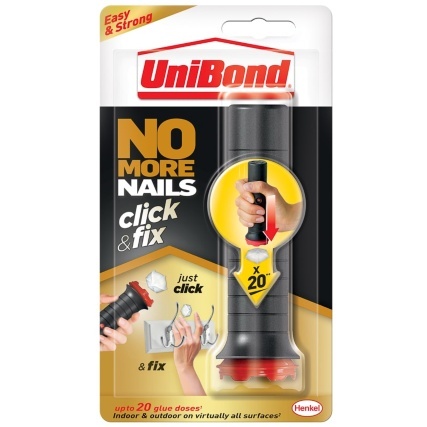 The first of its kind in construction adhesives, you get pre-dosed glue dots in one easy to use device. Make DIY at home quick and easy with Click & Fix! How do you Apply Click & Fix? It must be clean and dry with no dust, grease or oil. Next, press the device firmly against the object or wall. Spread the dots evenly on the area to be bonded. It will be adjustable for a few minutes and then you are done! In case the object does not hold instantly, add more dots along the surface to be bonded and press firmly against the wall. Heavy objects might require temporary support until the adhesive is cured. What Can I Glue with Click & Fix? 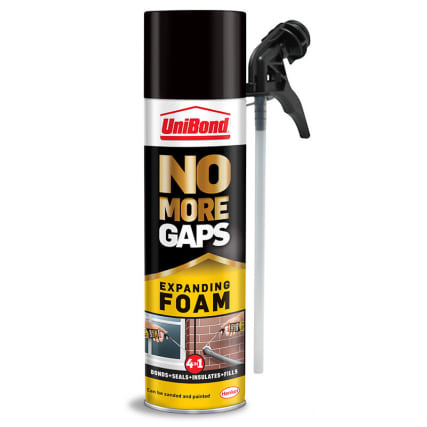 You can use it on almost all absorbent and non-absorbent materials including brick, ceramic, wood, hardboard, plasterboard, MDF, plywood, stone, concrete, metal, UPVC, glass, tile, plastics, painted surfaces and mirrors. You should wait approximately 24 hours before apply any weight to any mounted objects like shelves. However, exact curing speed depends on the surface, material, humidity level and temperature. 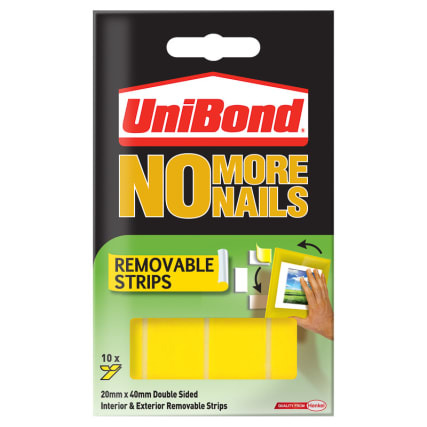 Porous materials and high humidity allow the adhesive to cure faster. Have you been busy with home improvement? 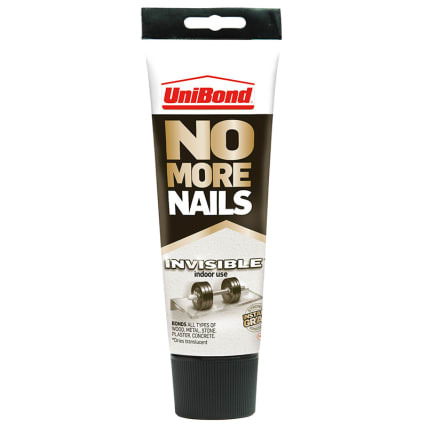 Show us what you've been up to with No More Nails Click & Fix on Facebook, Twitter & Instagram.